This was the second fruit galette I made for Thanksgiving this year. Pretty simple, totally delicious. Again, I don’t have any prep photos for this one. Again, you don’t need them. Use the same pastry recipe for my Berry Cherry Galette. 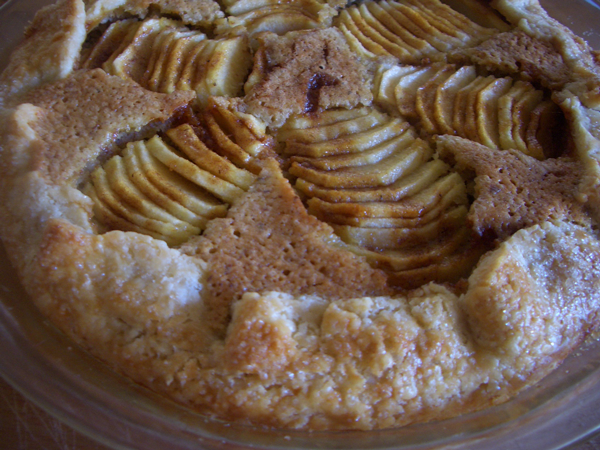 2 apples–use any good sweet/crisp/tart apple, I used Fuji. Peel the apples, cut into thirds and remove the cores. Put the apples in a bowl with enough water to cover. Squeeze the juice of the lemon into the water and add the lemon halves as well. Set aside. In a bowl, combine the frangipane ingredients, mixing until you have a smooth paste. For this recipe I think it’s a good idea to use a pie dish to help the galette hold its shape as it cooks, but you could also form it on a baking sheet. Put the pastry round in the dish. The pastry should come up the sides and extend over the lip by an inch or more. Add the frangipane and spread to the edge of the bottom of the dish. In a small pan, over medium heat, cook the sugar, cinnamon and nutmeg until the sugar melts. Set aside. Remove the apples from the water and pat dry with a paper towel. Slice each apple segment into thin slices, keeping the slices together. Press the sliced segments forward with the palm of your hand to fan and flatten the shape. Gently transfer the sliced segment to the frangipane. 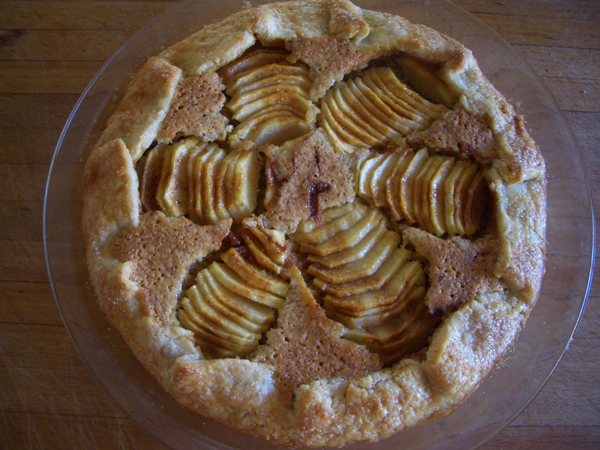 Do the same thing with the rest of the apple segments, placing them evenly around the pie plate. Brush the apples with the melted sugar glaze. Bake at 375F/190C degrees for about 45 minutes or until the crust and frangipane are puffed and golden and the frangipane is firm to the touch. Cool and serve with vanilla ice cream or whipped cream.